The first thing I ask myself when visiting a new yoga studio that I've never tried before is, "Is it a friendly place?" Is it welcoming and inclusive? If not, I'll probably never visit again. There's nothing worse than feeling intimidated and shy already, only to be met with teachers who ignore you and students who give you the stink-eye when you've unknowingly "stolen" their usual spot. This has happened to me at a couple of locations across the UK and I've just walked away from my practice at those particular studios (and on occasion, gym) feeling a bit sad; it's a shame for yogis and yoginis to foster this kind of hostile attitude and environment. It bring so much negativity to a practice that should be open, kind, and above all, humble. So, I was a little nervous to try the newest (and reportedly coolest, according to several online sources) studio in London. 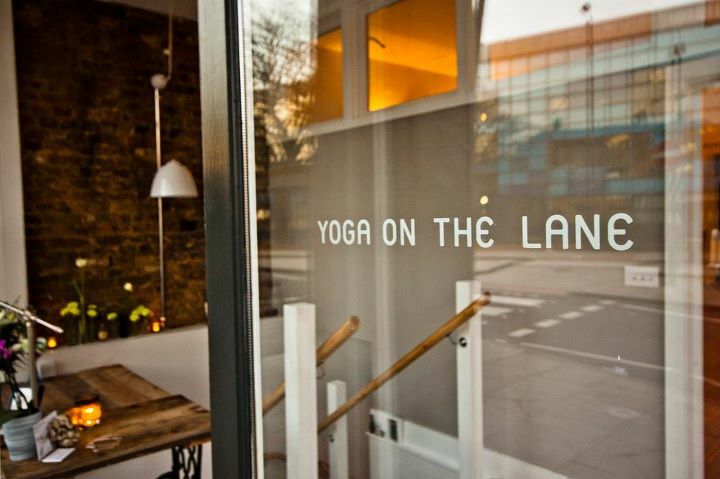 Not only is Yoga on the Lane in Dalston both friendly and inviting, but their beautiful studio and space makes you feel like you're practicing in the comfort of a friend's living room. Simply but tastefully decorated, the studio provides mats and a variety of props so you don't have to worry about bringing your own (plus, they don't smell, which is always good news to me). Upon entering the studio, I was surprised by how small the room was. Long and narrow, I was worried about space, though it did fit about 15 students comfortably. Did I mention that their studio's floors feature under-floor heating? Do you know how amazing that makes savasana feel? Or how amazing it feels to practice vinyasa flow in a room that's gently heated when you've traipsed in from -2 degree temperatures? The Level 1 class was taught by Tony Watson, whose background is in contemporary dance (like Lauren's). I remember closing my eyes at the beginning of the practice, when we worked on our pranayama, and feeling a smile creep across my face. I felt safe and mindful; I felt good. I was also concerned that the teacher wouldn't bother making corrections if the class was so full. I once took an ashtanga class where the instructor stayed on her own mat for the entire class - which is cool if that's the kind of instruction you prefer, but not for me, as I'm always striving to make improvements and learn more from my practice. I was super glad to see Tony making small corrections to students throughout, myself included, and grateful for his attention to detail. In particular, I found his detailed method of instruction helpful; I imagine it's difficult to teach alignment to students who haven't studied dance before (I had fourteen years of classical ballet training), but Tony managed to teach us how to feel correct alignment instead, which was both innovative and phenomenal. I left the class feeling much more positive about my day and the rest of the week. If those are the benefits of taking one class at Yoga on the Lane, I'm eager to find out what a regular practice there would bring me. If you find a best yoga studio then they are providing you good services that can help you to live healthy and happy life.